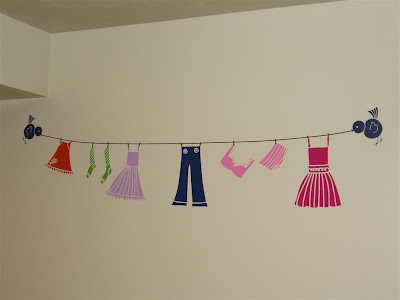 This adorable clothes line will spice up any laundry or mud room. It comes complete with 2 birds 4.5" high x 3.5" wide, two dresses in strawberry and lilac 6.5"high x 5.5"wide and 7.5"high x 5"wide, 1 skirt in orangcicle 4.5"high x 5"wide, 1 pair pants in navy blue 7.5"high x 5"wide, 1 bra in cotton candy 3"high x 3.5"wide, 1 pair undies in cotton candy 2.5"high x 3.5"wide, and 2 socks in line tree green 5"high x 1.7"wide and 4.5"high x 1.5"wide. 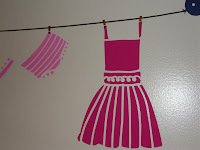 Also includes 20 clothespins in copper and clothesline in chocolate brown 45" long. Each piece is applied separately. Finished size will depend on the arrangement you choose to make when applying, approximately 13.5"high x 52"wide. 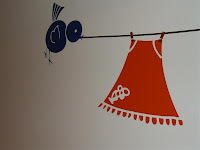 About WordCandy Vinyl Art:Each piece is made of high quality vinyl that can be applied to any smooth surface. Stick them to walls, doors, cars, windows, glass jars, metal, wood, concrete, virtually anywhere you want! The final product looks like paint without the mess!Instructions on how to apply included with every order. WordCandy Vinyl can be removed, but not repositioned to another surface. WordCandy Vinyl is not responsible for any damage to surfaces due to removal of vinyl decal. So sweet! 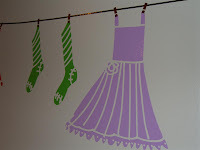 Vintage clothesline is perfect for my girls' room.